Yes it’s nearly that time of year again! That means that Cosy Tea have been sharing tea cosy patterns for almost a year now, as the first one I linked to was the Pumpkin Tea Cosy designed for the occasion. I noticed this pattern last year just a little bit too late for Halloween and bookmarked it to post about this year! It’s is a free knitting pattern designed by Tea Cosy Folk for Halloweenmania – a website about Halloween craft ideas, games, costumes, history and recipes. This knitting pattern is a simple stocking stitch tea cosy pattern knitted in double knit yarn on 5mm needles. There is a chart included to knit the face from (or if preferred you could swiss darn the image on after). The whole pattern can be viewed and printed here for free. 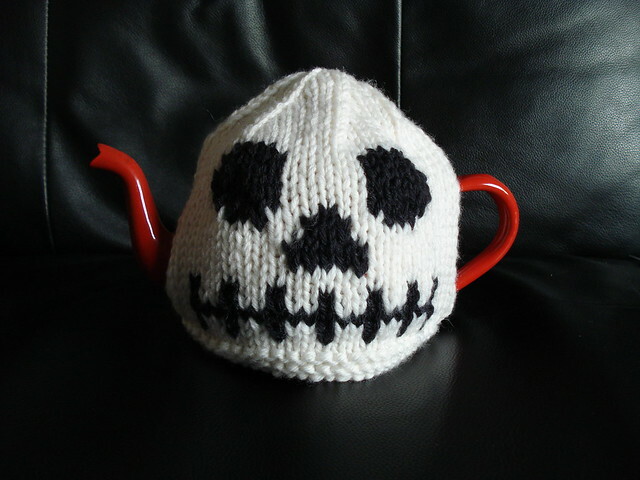 Tea Cosy Folk is a website dedicated to hand crafted tea cosies which are for sale either already knitted up or as a pattern. 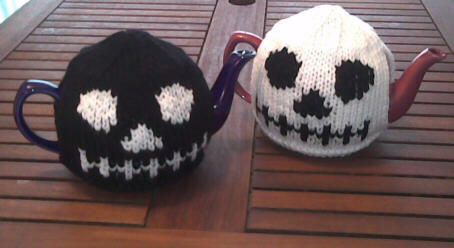 There are tons on there so take a look – there are loads of seasonal and novelty tea cosies to choose from. We think really if you’re going to pimp up your teapot for halloween then really you should be drinking Blueberry and Echinacea – to warn off autumnal colds and to soothe your stomach after you’ve finished with the punch! Ok, we promised some free patterns so here is the first one! We’re well into October now, it’s feeling pretty autumnal and halloween is approaching fast! 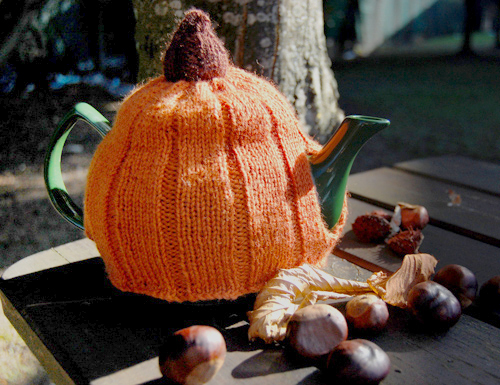 So what better way to embrace it than knit yourself a lovely pumpkin tea cosy? This cosy was designed by Faye at buttonsandbeeswax for a 6 cup tea pot, and the pattern can be found for free on her website, along with many other patterns for cute hats, mitts, cowls and accessories. Ok so the sun has taken his hat off, the nights are drawing in, and we’re starting to lack the enthusiasm to go out now here at Cosy Tea head quarters. So what better than to go home, snuggle up on the sofa in some woolly socks (yes it is that cold in my house) and get knitting tea cosies? We’ve decided to feature here, once a week when possible, a Tea Cosy Corner, showcasing our favourite free tea cosy knitting patterns. 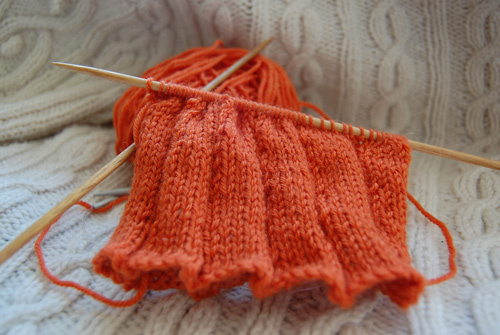 Our designer is currently working on a seasonal pumpkin knitting pattern, which we will share the results of next week!